In my own business www.fstopacademy.com, we offer free reports to get you started and then we follow up with email. Only after a two-month period do we begin to offer products for sale. Nobody likes the hard sell without a bit of understanding in advance of who you're dealing with, and what knowledge and experience you have to offer. Once you've created a report and it's on your website, what happens next? Well, now you have to create a series of emails and an 'opt in' form so that you can capture the data (contact details) and follow up with that customer regularly via email. Your group of subscribers is often known as your 'list', and in some cases, these lists can grow to many thousands of people. The beauty of this style of marketing is that it's very efficient because you can send one email to 10,000 people with the click of a mouse. There are two key aspects to working with auto responders. The first part is called an 'opt in' form. This is the little box which asks for your name and email address, and you need to add this to your web page. There is some work involved in setting up the auto responder sequence explained above, plus you now need to write a number of emails which will be sent at regular intervals once the report has been sent. But once you've done it, every time a new subscriber fills out their details on your landing page, the auto responder kicks in and will send out these emails automatically. This means that while you are filming jobs or on holiday, this system communicates with that prospective customer with no additional work from you. I have no idea why more businesses do not use this method, because it's simple, cheap and a very effective way of nurturing customers, and all of it's done automatically. Of course, there is no reason why at the end of every email, you have an offer for them to give you a call. For example, you could have a P.S. that says, "if you're ready to discuss a project, please call and see how I can help you further" and insert your phone number. Identifying what works best for your market is something that you can only develop over time and don't forget to test. 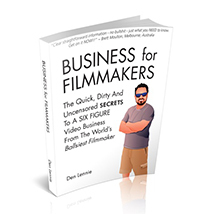 Excerpt taken from Den Lennie's book "Business for Filmmakers, the Quick, Dirty and Uncensored SECRETS to a Six-Figure Video Business from the World's Ballsiest Filmmaker"